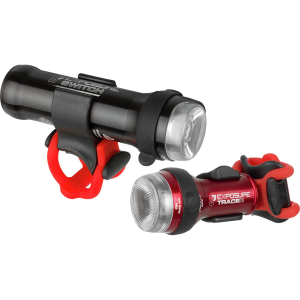 Give yourself the competitive edge on your commute with the compact yet powerful Exposure Switch Mk2 DayBright and TraceR Light Combo. Both are housed in robust CNC-machined aluminum for durability and water-resistance out on the road, while the included handlebar and seatpost mounts make for easy, secure attachments. The Switch Mk2 blasts a whopping 1,000 lumens of light to flood the streets with, while the TraceR keeps you covered with 75 lumens of red light to ensure you're easily spotted by approaching motorists. Both lights offer three separate modes to help you adapt to the changing light conditions during your ride, and both come equipped with a Fuel gauge display to let you know just when you have to recharge.